Covering a vast area of 2750 sq. km out of which 303 sq. 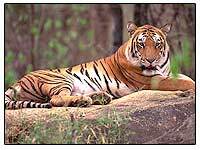 km from the core area, thick biosphere reserve is a sanctuary and one of the Tiger Projects and National parks of India. With wide range of rain falls and edaphic variations, range from dry deciduous to moist green forests, it is suitable to different species of flora and fauna. About 1076 species of mammals, 29 types of reptiles and 231 species of birds are the proud possession of this plateau. Average mean elevation of Similipal is 900 meters. Tall and luxuriant Sal Trees in large numbers stand like sentries. The handsome peaks of Khairiburu (1178 meters), Meghasani (1158 meters) and others welcome like smiling receptionists from the emerald heights. Sweet scented Champak flowers freshen the air. The richly hued orchids on the green foliage are soothing to the eyes. In the midst of the dense forests, the summer stands humbled and the sun gets lost. 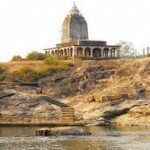 Several rivers like Budhabalanga, Khairi, Salandi, Palpala, etc. originate from the hills and meander through the forest like veins and arteries in the body. 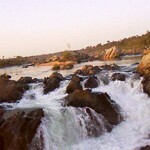 Many of them have formed cascading rapids and foaming falls before leaving for the plains. The panoramic view of the waterfalls at Barehipani (400 meters) and Joranda(150 meters) are simply enchanting of fish, is found in abundance in most of the rivers. The silence of Similipal is occasionally broken by the chirping of the birds to an avian delight. The dense forest and riverine system serve as an excellent home to some of the most beautiful creatures of the World. To stay with them, even for a while, is a thrilling experience. Herds of elephants majestically walking across the roads and rivulets could be a regular sight. While you are moving on the hilly tracts, predators like Tiger and Leopards might be obliviously lulling under the shade with their own thoughts. If lucky, you could spot them there, or else see them around the saltlicks at places like Chahala. Forget the apprehensive dear at Similipal is at its natural best. The crocodile rearing centre at Ramtirtha near Jashipur is an additional attraction.An epitome of fascinating beauties, Similipal beckons you for a sojourn of its mind boggling interiors. it will fill your lungs with cool and clean air, your nose with fresh and free fragrance, your eyes with soothing sights, your ears with sonorous sounds and your heart with a hypnotic throb. After trip, your body is sure to feel rejuvenated.Similipal also provides succor to thousands of tribal people living on the fringe. A glimpse of the tribal culture will therefore be a bonus at no extra cost. 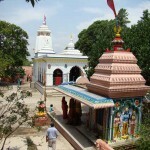 Pithabata (22 kms) & Jashipur on N.H.-6 (94 kms) are two entry points. Entry permits can be obtained from the Range officer, Pithabata Check gate & the Asistant Conservator of Forests, Jashipur respectively. The park remains open for tourists from 1st November to 15th June. Road – Baripada, the district headquarters of Mayurbhanj, on the junction of NH 5 and 6, is 170 km from Bhubaneswar, 240 from Kolkata and 60 km from Balasore and 22 km from Pithabata, which is an entry point. 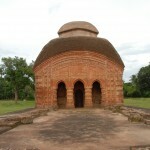 The other entry point Jashipur is 94 km from Baripada on N.H. 6. Both the places are well connected by regular bus services. Taxis and Jeeps are available. Rail – Nearest railhead is Balasore (60 km from Baripada), served by major trains running on the South-Eastern sector. We, at Hotel Ambika, provide accommodation facilities for tourists of Shimilipal Reserve. Contact us to book your accomodation. 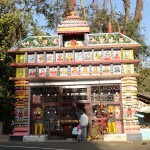 Tourist office, Baripada. Ph. 06792 – 252710/ Assistant Conservator of Forests, Jashipur. Tourist can move inside the sanctuary within tourism zone in their own vehicles. Four wheel driven vehicles are preferable considering the hilly terrain and kacha road. Vehicles are also available on hire from Jashipur and Baripada. The charges for hiring vehicle varies from Rs.900/- to Rs.1,200/- per day depending upon the type of vehicle. Heavy vehicles and two wheelers are not allowed. Drivers of the private owned vehicles of Jashipur and Baripada are trained regularly before the onset of tourism season.